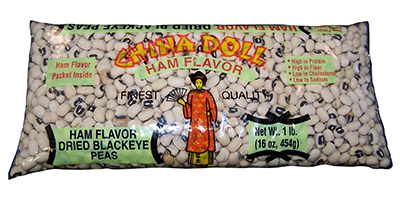 Ham Flavor Packet Ingredients: Hydrolyzed Vegetable Protein, Monosodium Glutamate, Natural Hickory Smoke Flavor, Artificial Flavor, Tricalcium Phosphate (prevent caking). 2.Wash beans in cold water. 3. Cover beans with about 2 inches of water and soak overnight (OR add 6 cups of water to peas, boil 2 minutes, let stand 1 hour). 4. Bring to boil, reduce heat and simmer until peas are tender, adding water if necessary. 5. Stir in contents of flavor packet only when peas are done – just before removing from heat. Makes 11 – 5 oz. servings (exclusive of liquid). YIELD: 1 lb. of DRIED Blackeye peas (approximately 1-3/4 cups) equals approximately 6-1/2 cups COOKED peas.